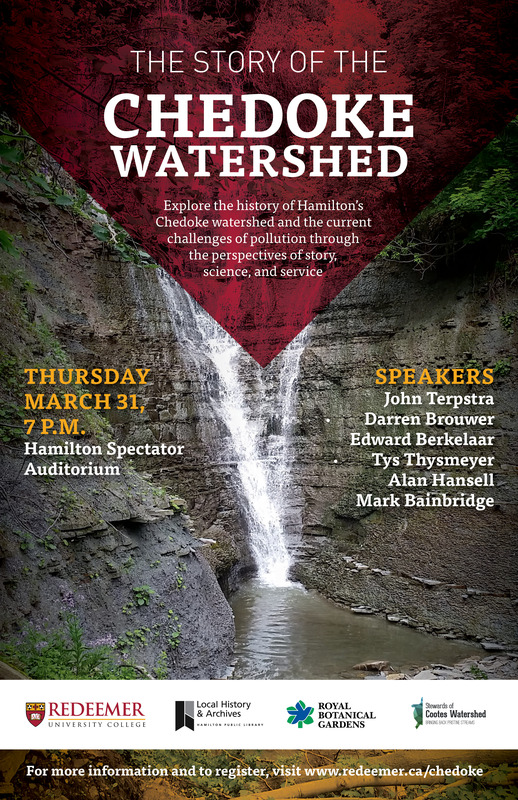 Wolsak and Wynn releases Daylighting Chedoke non-fiction book, which is about a hidden, local creek, this month. The Toronto launch hosted by the publisher as part of their Fall Launch will be October 22, 2018 at the North Ballroom of The Gladstone Hotel, 1214 Queen Street West, Toronto 7:00 p.m. to 10:00 p.m. A Hamilton Area launch hosted by the publisher as part of their Fall Launch will be held at the Staircase Cafe Theatre, 27 Dundurn Street North, October 23, 2018 from 7:00 p.m. to 10:00 p.m.. Other authors whose books will be launched at both events are Andrew Wilmot, Lauren B. Davis, Julie McIsaac and Peter Norman. Glenn Macdonald and John are staging an evening event with Glenn's music and John's words at the Artword Artbar, Wednesday, May 16 at 8:00 pm, in downtown Hamilton (15 Colbourne St, just west of James St N). John plans to include a preview of his next non-fiction book, which is about a hidden, local creek, and is called Daylighting Chedoke. THE ST. THOMAS POETRY SERIES published In the Company of All a book of prayers from Sunday mornings at St Cuthbert’s in late summer / early fall 2016. The Toronto launch hosted by the publisher was November 19, 2016 at St. Thomas’s Church, 383 Huron Street, Toronto at 7:30 p.m. A Hamilton Area launch hosted by Redeemer University College was held on campus in the Redeemer University College dining hall November 24, 2016 from 7:00 p.m. to 9:00 p.m.
A Rocha is focused on transforming people and places through hands-on conservation projects, environmental education programs and sustainable agriculture initiatives. John’s poetry was featured at this year’s A Rocha annual gathering in Hamilton, Ontario. Music was provided by the Nabi Sue. Participants enjoy a dinner from the catering staff at Karam Kitchen and listened to A Rocha interns share stories of creation care. A Rocha is an international Christian organization which engages in scientific research, environmental education, community-based conservation projects and sustainable agriculture. LitChat is a Hamilton, Ontario based literary salon supported by the Hamilton Public Library and Hamilton Arts Council. On October 11, 2016, John lead a conversation about tracking down the natural landscape in an urban environment focusing on his recent essay “Daylighting Chedoke.” “Daylighting Chedoke” appeared in issue 8.2 of HA&L Hamilton Arts and Letters. GritLit, Hamilton’s annual readers and writers festival hosted a panel discussion about writing the gritty city on Sunday afternoon, April 10, 2016 at 4:00pm. Featuring Kim Echlin, David Lee, Rachael Preston, John Terpstra and Brent van Staalduinen. A diverse audience attended the Tuesday, April 12, 2016 edition of the Art Bar Poetry Series, held at the Black Swan Tavern, 154 Danforth. 8 P.M. John shared the stage with Sheniz Janmohamed and Zach Da Costa. …On Thursday June 16, John participated in a 4-day conference on Making Coomon Causes: Crises, Conflict, Creation, Conversation in the context of global climate change, soil depletion, “the enclosure of the commons,” the acidification of the oceans, ground water contamination, mass extinctions at Queen’s University in Kingston, Ontario. John was part of a session on “Urban Space as Environmental Commons: The Storied Landscape of Hamilton” along with Matthew Zantingh (Briercrest College and Seminary), Chair, Daniel Coleman (McMaster University), “Yard Work," Doug Sikkema (University of Waterloo), “Semiotics and the City: Reading the Lines of Hamilton." John read portions of Falling into Place as well as a few poems in which Hamilton is the subject. Time 1:15 – 2:45. John joined Redeemer University College professors Darren Brouwer (Associate Professor of Chemistry) and Edward Berkelaar (Professor of Chemistry and Environmental Studies), head of natural lands for the Royal Botanical Gardens Tys Thysmeyer, Stewards of Cootes Watershed head Alan Hansell and City of Hamilton Director Water & Wastewater Planning & Capital Mark Bainbridge in exploring the history of and current challenges facing Hamilton’s Chedoke watershed. Location: Hamilton Spectator Auditorium. Time: 7 P.M.
On September 16, 17 & 18 John gave a series of readings of “personal poetry and private memoirs” in the Ozinga Chapel Auditorium of Trinity Christian College in Palos Heights. Illinois. Day 1: Memoir readings from John’s book, The Boys: or, Waiting for the Electrician’s Daughter, relates to his three brothers-in-law, who each died from the same terminal disease, but who inspired others with their humor, liveliness, and courage. Day 2: Non-fiction prose from John’s latest book, The House with the Parapet Wall, weaves stories of caring for his elderly mother with notions of home and place; and stories of the 19th century brick houses in his city neighborhood and the families who lived in them, then and now. Day 3: Jazz accompanied poetry readings from John’s many books of poetry, including poems commissioned by his church music director and written specifically for Sunday mornings, but meant for the whole world. From late March through mid-April John will be giving readings in Hamilton and Toronto. 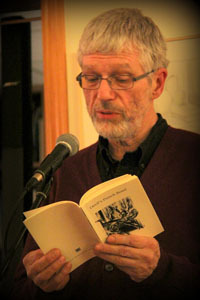 From late February through mid-March John gave readings in Hamilton, various New Brunswick locations and Grimsby. The New Brunswick readings were given during a week-long residency at St Mary’s in Halifax from Monday, March 2 to Friday, March 6. Join John and Marilyn Gear Pilling for the luanch of their most recent books. 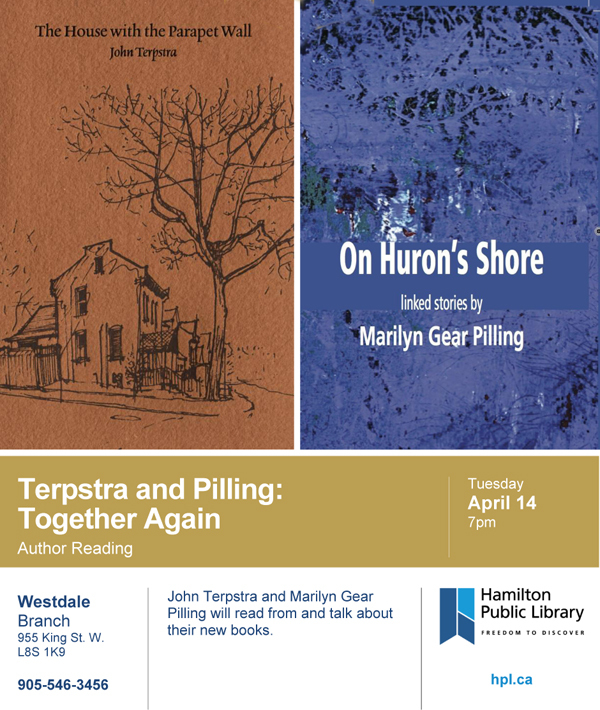 John will read from his newest memoir The House with the Parapet Wall, and Marilyn will read from On Huron's Shore, a collection of stories published by Demeter Press. On Huron's Shore is a collection of linked stories about mothers, daughters, and sisters, set in the landscape of the Huron County of the mid-fifties juxtaposed with the Huron County of today. The House with the Parapet Wall is John’s fourth work of literary non-fiction. 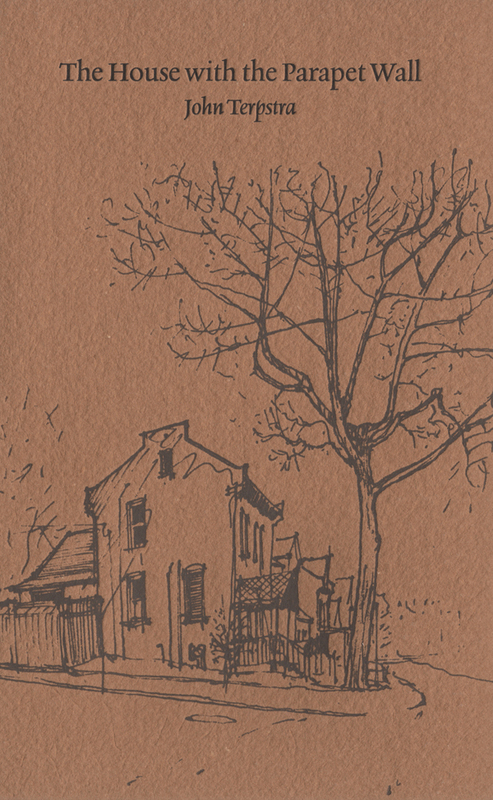 Grieving the diminishment and death of his elderly mother, John Terpstra finds solace in a seemingly unusual place: the stories (both historical and fanciful) of the nineteenth-century houses in his Hamilton neighbourhood and of the families which have inhabited them. 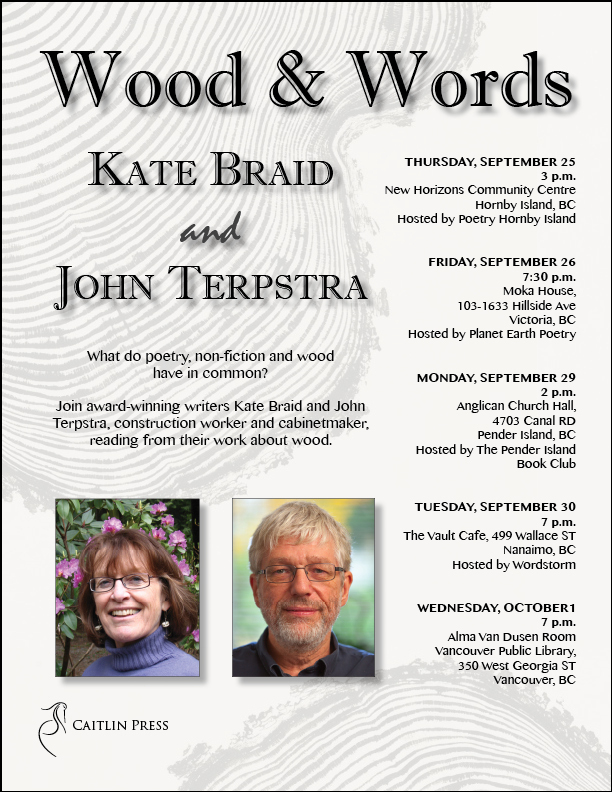 John gave a series of readings with Kate Braid in British Columbia between Thursday, September 25 and Wednesday, October 1. Locations included Victoria, Hornby Island, Pender Island, Naniamo and Vancouver. Both John and Kate are or have been woodworkers and / or carpenters. Kate was the first woman to be admitted into the BC Carpenter’s Union. Kate has published five books of non-fiction and five of poetry, including co-editing with Sandy Shreve the ground-breaking book of Canadian form poetry, In Fine Form. Her work has won or been short-listed for a number of awards and is widely anthologized. Like John, Kate has done collaborations with musicians in her work. She has written extensively about her fifteen years as a carpenter including two books of poetry and her most recent work, a memoir, Journeywoman: Swinging a Hammer in a Man's World. Thursday 25 September, 3 p.m. Hosted by Planet Earth Poetry. Hosted by two local book clubs. This event features a Summer, Saturday evening in the garden with poetry, great music, great art and great food with acoustic musician and singer/songwriter Peter Tigchelaar, award-winning poet John Terpstra and sculptor Heidi Brannan. Those who attended enjoyed a real BBQ from The Artist Garden chefs with s'mores on the campfire for dessert! see the event notice here. gritLIT partnered with LitLive for a gala closing night celebrating the recently-published works of seven Hamilton authors. Presenters include Chris Pannell (A Nervous City), John Terpstra (Brilliant Falls), Jeffery Donaldson (Slack Action),Amanda Jernigan (All the Daylight Hours), Marilyn Gear Pilling (A Bee Garden), Amanda Leduc (The Miracles of Ordinary Men) and David Haskins (This House Is Condemned). 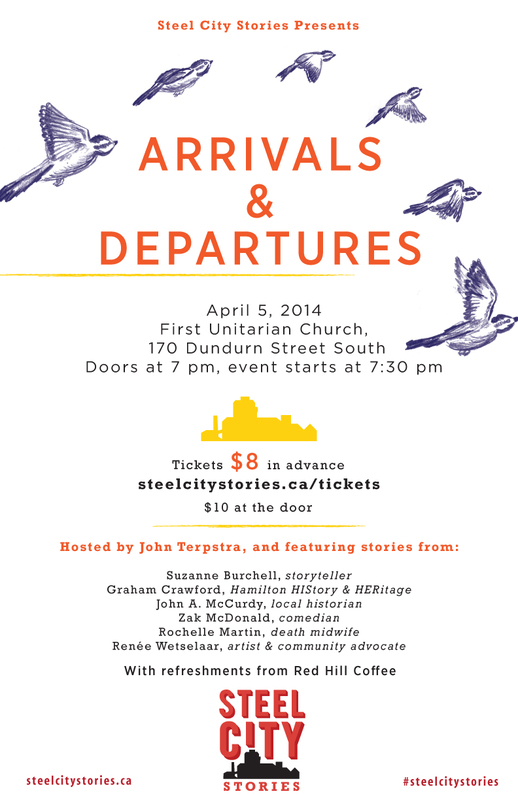 Many attended Arrivals and Departure, a Steel Cities Stories event hosted by John. 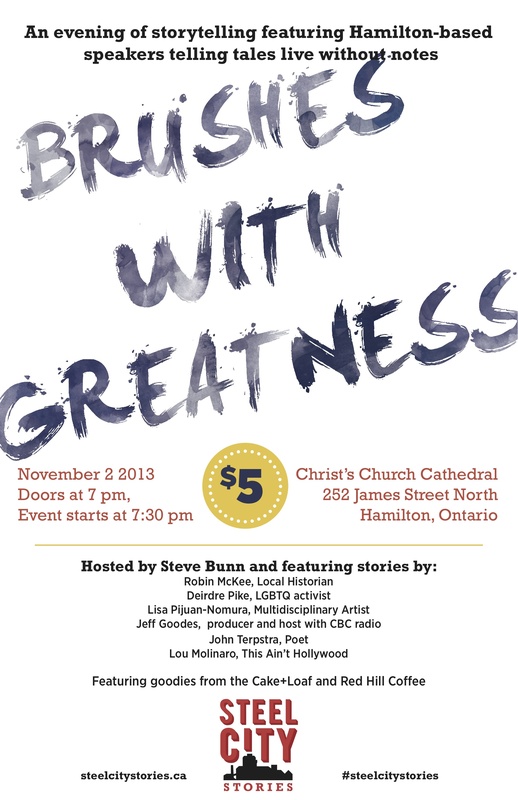 The event featured stories by Suzanne Burchell (Storyteller), Graham Crawford (Hamilton HIStory + HERitage), John A. McCurdy (Local Historian), Zak McDonald (Comedian), Rochelle Martin (Death Midwife), Renée Wetselaar (Artist & Community Advocate). 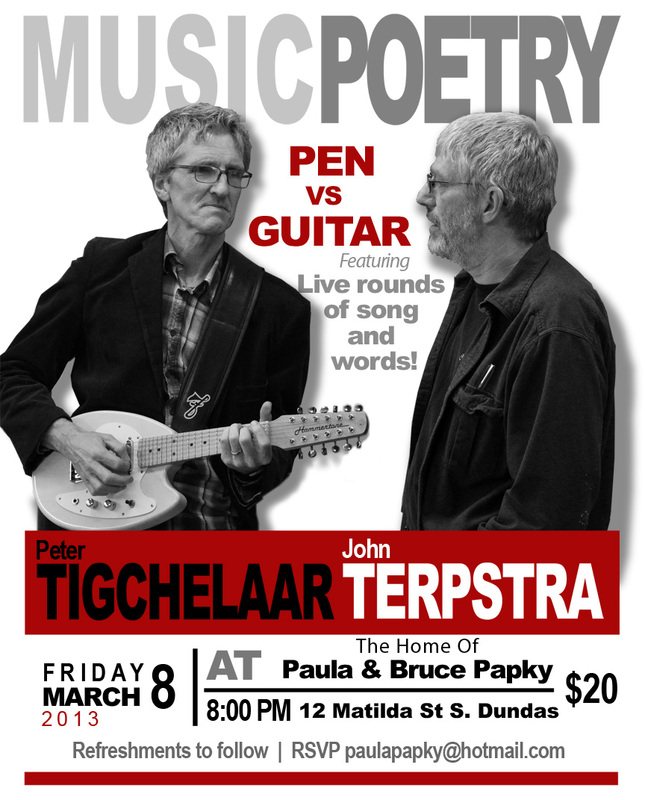 Peter Tigchelaar and John faced off again with more live rounds of song and words. for the 2013 round see the posting here. 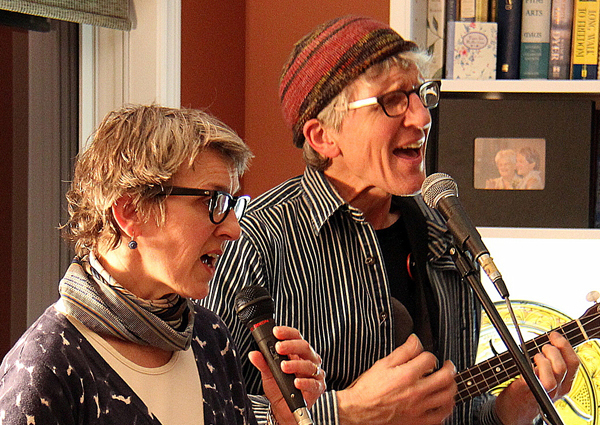 The John Laing Singers presented an afternoon of poetry brought to life through music with live readings by John. With a professional string quartet as accompaniment, the afternoon’s choral music was based on poetically substantial texts, including: Invisible Harps, featuring music such as Three Shakespeare Songs by Ralph Vaughan Williams, Dark Night of the Soul by Norwegian phenomenon Ola Gjeilo, Five Hebrew Love Songs by Eric Whitacre (with poetry by his wife, Hila Plitmann), and the Cantique de Jean Racine by Gabriel Fauré. John read from his most musical poems. The readings were scattered throughout the concert. The Giant’s Rib Discovery Centre (GRDC) presented John Terpstra, speaking on themes in his new work in progress, The House with the Parapet Wall. The presentation was part of this year’s Bruce Duncan Memorial Lecture Series. The Bruce Duncan Memorial Lecture Series runs once a month from September through May. This series presents topics relevant to the Niagara Escarpment World Biosphere Reserve as a part of the GRDC’s public education programs. 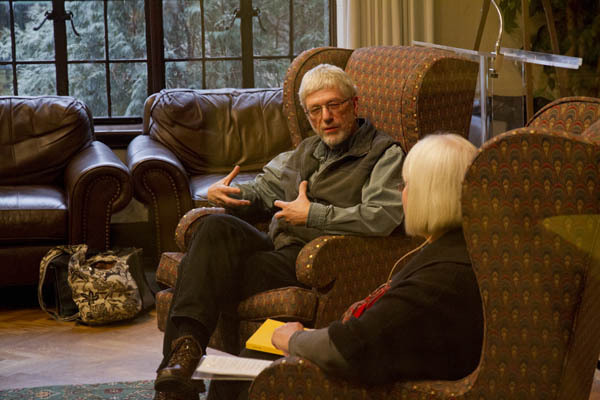 The public was on heand to attend a reading and talk by John Terpstra about his poetry in Dr. Sarah Winters and Dr. Susan Srigley’s “The Bible as Cultural Text” Dialogue course. 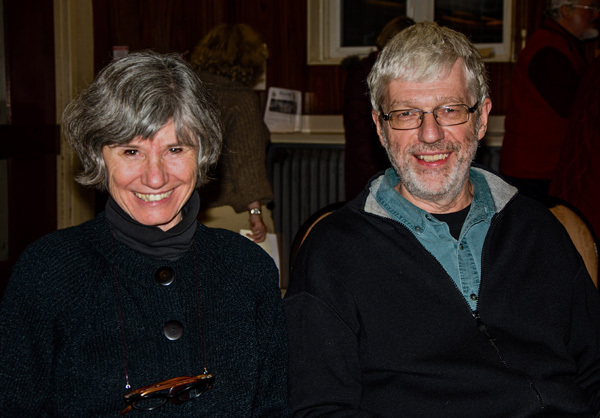 Hamilton Poets Bernadette Rule and John Terpstra at the reading — Photograph: David O'Rourke. Many attended The St. Thomas Poetry Series 25th Anniversary poetry reading. Featured poets were Philip Gardner, Richard Greene, John Reibetanz, Bernadette Rule, Margo Swiss and John Terpstra. John read from his most recent work and from Naked Trees, as a part of the Faculty of Environmental Studies' lunchtime poetry series, LunchWords. The Faculty of Environmental Studies (FES) at York University has undergraduate and graduate programs in Environmental Studies, many of which focus on reading, writing, and art as important for environmental politics and praxis. 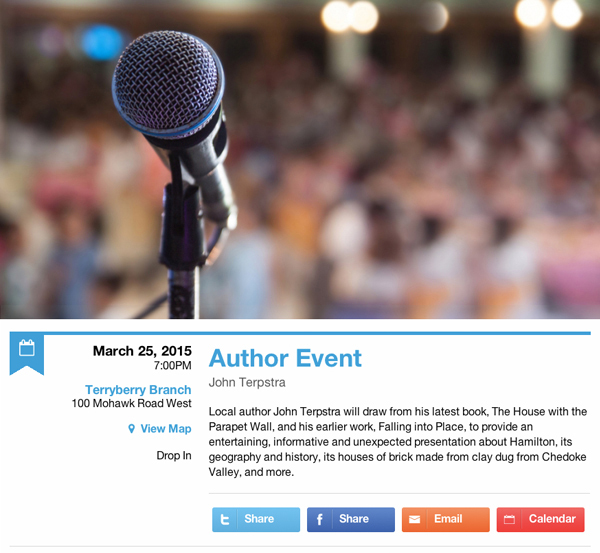 LunchWords is a new event for FES and John was invited to be one of their first guest speakers. In this series, the aim is to foster an ongoing discussion about environmental literature and writing of all kinds, by providing a space for students, faculty, staff, and community members to hear writers read their work and to engage in lively conversations afterwards. Toronto Launch of Brilliant Falls. 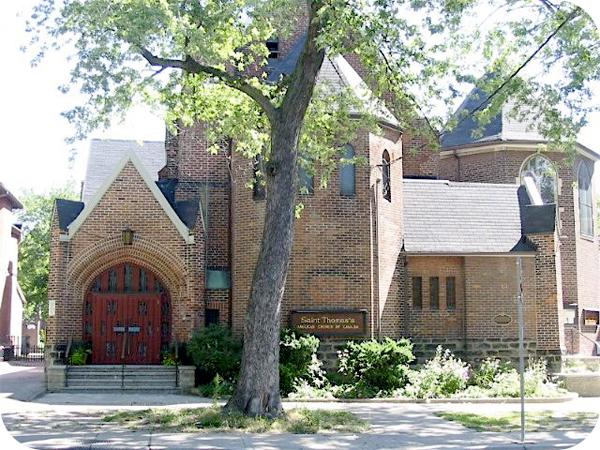 The Toronto launch of Brilliant Falls was on Wed 8 May at St Thomas Church, 383 Huron Street, Toronto, where John read with John Reibetanz, who also has a new book to launch. John supported the publication of his new book Brilliant Falls with a reading at the Art Bar Poetry Series, held at Q Space, 382 College Street West, in Toronto on Tuesday, 7 May, 8:00. Gaspereau Press author Sue Goyette read from her new poetry collection at the same event. They were joined by author Jacob McArthur Mooney. One Day after the Hamilton booklaunch for John’s new book of poetry, Brilliant Falls Gaspereau Press authors Sue Goyette and John Terpstra launched their new poetry collections at the Organic Works Bakery, 222 Wellington Street, London. This event was a special year-end poetry party to cap off Poetry London’s 2012/2013 season and also featured authors Debra Franke and Jessica Hiemstra. Launching Brilliant Falls, John’s new book of poetry from Gaspereau Press. 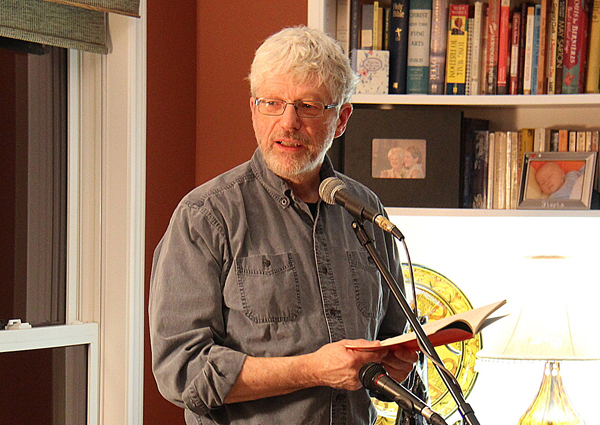 The Hamilton booklaunch for John’s new book of poetry from Gaspereau Press, called, Brilliant Falls was on Friday 3 May at Gallery on the Bay, 231 Bay North, Hamilton, Ontario. John read with Marilyn Gear Pilling, who was also launching that night. As part of the Gaspereau Press launch of Brilliant Falls, John was in Nova Scotia April 17, 18 and 19. All Gaspereau Press spring poetry books were officially released at Gaspereau Press Poetry Tra-La!. Readings featured John, Peter Sanger, Allan Cooper, Harry Thurston and Sue Goyette. Andrew Steeves will be hosting. The weekend included two readings featuring John, and Peter Sanger. John read from Brilliant Falls; Peter Sanger read from his new book Fireship: Early Poems — 1965–1991. 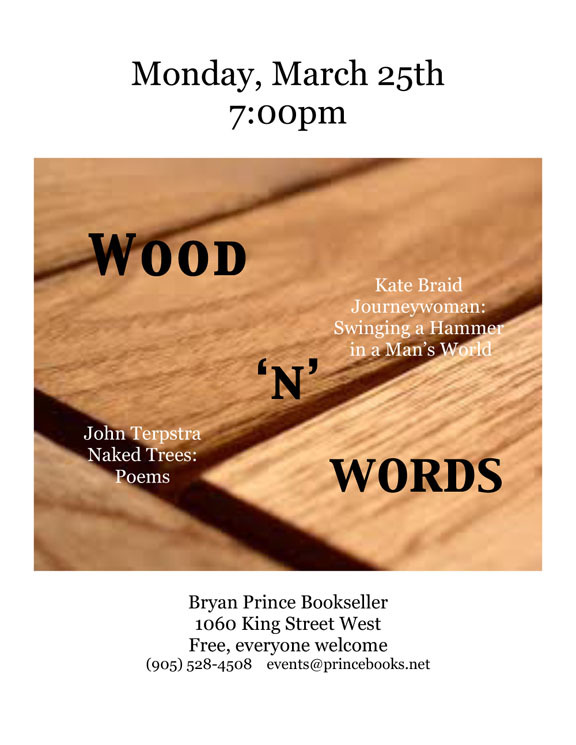 John joined Kate Braid for Wood ‘N’ Words, a reading held at Bryan Prince Booksellers, March 25. Kate Braid, from Vancouver BC, read from her book Journeywoman: Swinging a Hammer in a Man's World, and John, as a fellow (ahem) carpenter, read work-related work. 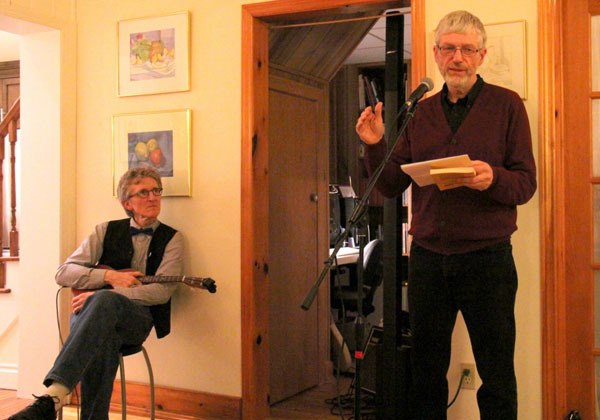 Dozens joined John and Peter Tigchelaar for a house concert and reading featuring live rounds of song and words at the home of Paula and Bruce Papky. Peter and John told stories of their high school escapades. Peter played his ukelele, mandolin and a unique, also small instrument called Hammertone, singing his own songs as well as Credence Clearwater Revival, a Shaker hymn, and a Benedictine chant for a Friday. John read poems that spanned immigration, squirrel house-invasion and woodworking. Location — 12 Matilda Street, S., Dunadas, Ontario — 8:00 pm. On the afternoon of Monday, February 18 John was interviewed by Deborah Bowen in the Fireside Room at Trinity Christian College, 6601 West College Dr., Palos Heights Ill., 60463 (see photograph above). This was followed by a reading from his work. He was a guest in Pete Post’s Education class at 8:00 in the morning on Tuesday, February 19 to discuss The Boys. for more images see this link. The photos and video were taken by Erick Sierra, Assistant Professor of English, Trinity Christian College; photos and videos are courtesy of Trinity Christian College. On Friday Evening John was be the special guest at a conference that owed it’s title and inspiriation to John’s book Falling Into Place. John also presented a breakout session at this conference on Saturday. John Joined writer Olive Senior and Toronto singer / songwriter Corin Raymond for this annual event, and The West Grey Library system supported the festival, and poetry in general, by purchasing five books suggested by audience attendees. They are Tanya Davis’s At first, lonely, Terry Ann Carter’s Day Moon Rising, John Terpstra’s Naked Trees, Oliver Senior’s Trees, and Kateri Akiwenzie-Damm’s edited volume of contemporary indigenous writing, skins. The Charles Taylor Prize for Literary Non-Fiction presents a conversation on writing about the elusive, fraught and romantic world of love with authors Elizabeth Abbott, James Chatto and John Terpstra. The CBC’s Mary Ito moderates. Held at Toronto’s historic Glenn Gould Studio the evening featured an hors d'oeuvres reception, a concert from singer-songwriter Miranda Stone, and readings from poets John Terpstra and Luci Shaw and award-winning novelist Deborah Joy Corey. The evening was capped off with a discussion with all four artists.